The London theatre district can trace its history back to Shakespearean times, and while audiences can't catch the original staging of "Romeo and Juliet", they can still get tickets for the three longest-running shows ever staged in the West End. "Les Miserables" and "The Phantom of the Opera" are perhaps the two shows most associated with modern musical theatre. While these shows have gone on become international sensations, both musicals originated in the West End, and continue to dominate the London box office to this day. 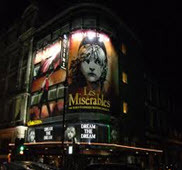 Respectively, "Les Miserables" and "The Phantom of the Opera" have continuously played in the London theatre district for 27 and 26 years. "Les Miserables" takes Victor Hugo's story of love and death in the French Revolution to dramatic and emotional heights rarely achieved in musical theatre. The show's climactic song, "Do You Hear the People Sing" later become associated with the Tiananmen Square protests and peaceful revolutionary protests all around the world. Andrew Lloyd Webber's "The Phantom of the Opera" made British performers Michael Crawford and Sarah Brightman household names overnight, and 26 years later, the show's love theme "The Music of the Night" is one of the most instantly recognizable songs in musical theatre history. Visitors new to the London theatre scene may not realize that there is show produced in the West End that is not only the longest-running show at the London box office, it's the most continuously staged play in modern theatrical history! 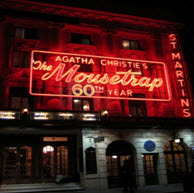 Agatha Christie's "The Mousetrap" opened in the West End in 1952, and the curtain hasn't fallen since. This classic mystery has become forever part of the story of the London theatre district, and true to Agatha Christie's wishes, the original short story has never been published in Britain, and will remain unpublished until the play closes for good. However, with over 24,500 performances to date, it's unlikely that day will come any time soon! Visitors to London still line up at the box office for this uniquely British theatrical experience, and for the famous twist ending, which the audience is always asked not to reveal. These three productions are the current record holders for longest-running shows in the London theatre scene, but there are plenty of other long-running productions making London box office history today, and new works are premiering in the West End every year. Make plans to visit the London theatre district today!